1. 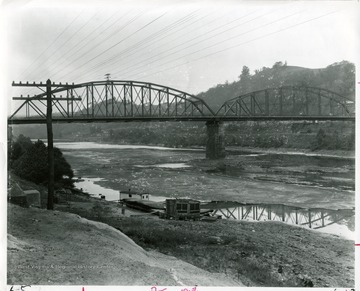 Monongahela River During 1930 Drought, Morgantown, W. Va.
Monongahela River During 1930 Drought, Morgantown, W. Va.
'Many Morgantown residents can remember walking across the dry river bed during the 1930 drought.' 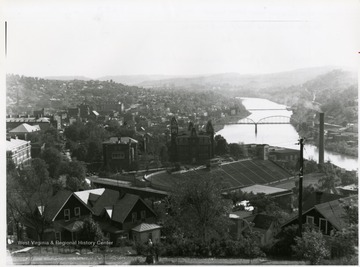 Morgantown and Westover bridge visible. 2. Monongahela River and West Virginia University Main Campus, Morgantown, W. Va.
Monongahela River and West Virginia University Main Campus, Morgantown, W. Va.
A view of the river and West Virginia University's main campus from Lorentz Avenue. The Morgantown/Westover Bridge is in the distance. 3. 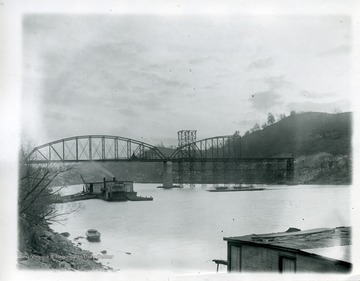 Railroad Depot and River Bridge, Morgantown, W. Va.
Railroad Depot and River Bridge, Morgantown, W. Va.
4. Preparing for a Wind Symphony Concert on the Banks of Monongahela River, Morgantown, W. Va.
5. 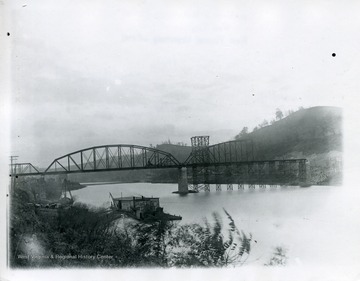 River Bridge Under Construction, Morgantown, W. Va.
River Bridge Under Construction, Morgantown, W. Va.
6. 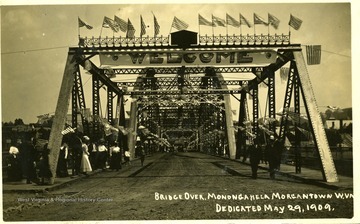 Dedication of the Steel Bridge over the Monongahela River at Morgantown, W. Va.
Dedication of the Steel Bridge over the Monongahela River at Morgantown, W. Va.
7. Dedication of the Steel Bridge over the Monongahela River at Morgantown, W. Va.
Townspeople are celebrating the dedication off the bridge over the Monongahela River between Morgantown and Westover in Morgantown, West Virginia. 8. 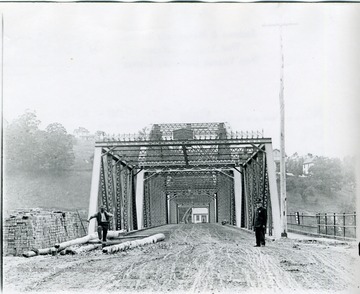 Construction of the River Bridge over the Monongahela River at Morgantown, W. Va.
Construction of the River Bridge over the Monongahela River at Morgantown, W. Va. 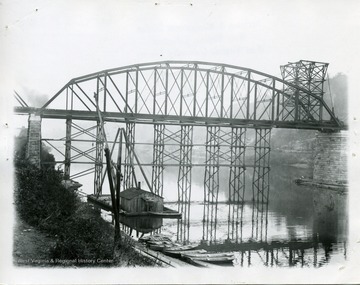 The River Bridge during construction. 9. 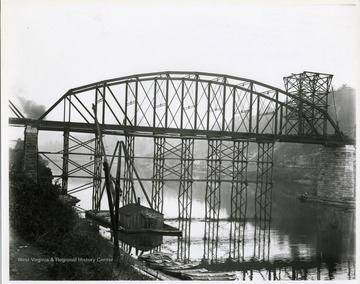 Construction of the River Bridge over the Monongahela River at Morgantown, W. Va.
A view of the River Bridge in Morgantown, West Virginia. 10. 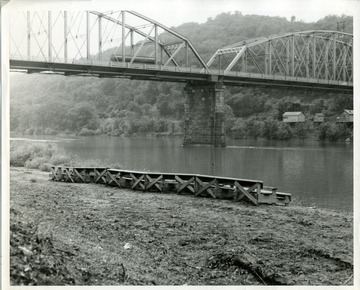 River Bridge Under Construction, Morgantown, W. Va.
View of the bridge spanning the Monongahela River. 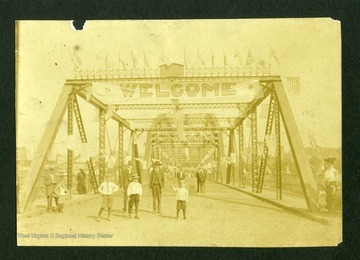 Two men standing in front of bridge. One man wearing a suit and a badge. To the right of bridge is a pedestrian walkway. 11. River Bridge Under Construction, Morgantown, W. Va.
A view of the Monongahela River flowing underneath the River Bridge in Morgantown, West Virginia. 12. 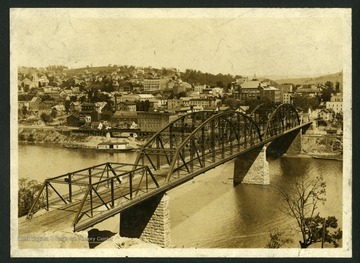 River Bridge and Morgantown, W. Va.
River Bridge and Morgantown, W. Va.
A view from the west of Morgantown, West Virginia.